Check out the image illustrating this article. It looks amazing, doesn’t it? If you show it to your average person, it’s practically guaranteed they’ll identify it as a hologram. It’s not, but it’s an understandable mistake. In addition to Bill Nye mistakenly asserting the Pepper’s Ghost-based effects at Disney’s Haunted Mansion were accomplished with holograms, there have been plenty of instances where products utilizing the Pepper’s Ghost effect were openly publicized as involving holograms in some way. Oh, and that “Tupac Hologram” you’ve heard oh so much about? Pepper’s Ghost. Although several of the props I’ve discussed in the past have their origins in the 90’s, the Pepper’s Ghost illusion actually dates back to 1584! That’s when Giambattista della Porta described an illusion set up like the one this article is dedicated to in Magia Naturalis. However, the effect remained obscure for 278 years until British inventor Henry Dircks created his own version. Although he tried getting theaters to use his creation, his goal was not to make money on a flashy new special effect. Instead, the intent was to fight against hoaxers using “séances” to trick people out of their money by creating an effect superior to the ones they were using and then reveal how it works. But the expense of remodeling a theater to house the effect left theater owners leery. Enter John Pepper. Impressed by the illusion, he teamed up with Dircks and figured out a way to simplify the “Dircksian Phantasmagoria” so that it could be put into any theater and still keep the impressive quality. Although this led to the effect becoming a hit when it premiered, it also resulted in the public giving it the name “Pepper’s Ghost.” Despite Pepper’s best efforts to make sure Dircks received proper credit, the name stuck. Although Dircks bore no animosity towards Pepper, he did express his displeasure by attacking other parties. The last documented use of the effect in a theater was in 1890 and later uses of the effect involved film. Unlike the similarly historic Bottomless Pit effect, Pepper’s Ghost has somewhat better documentation for its uses prior to its appearance in the online haunted attractions community. It was the basis of the famous “Girl to Gorilla” sideshow illusion, whose earliest performance dates back to 1960. Not long after, it was used to create the ghosts, haunted mirror and Madame Leota effects at Disney’s Haunted Mansion attraction in 1969. Due to the Imagineers failing to take the reflective nature of the effect into account during the construction of the ballroom scene, the female ghosts appear to be leading the men during the grand dance. The 70’s saw it being adapted for use in museums. While most directions for constructing the effect were aimed at professions, the oldest instructions for a home-built version that I could find appeared in an 80’s issue of Popular Electronics. 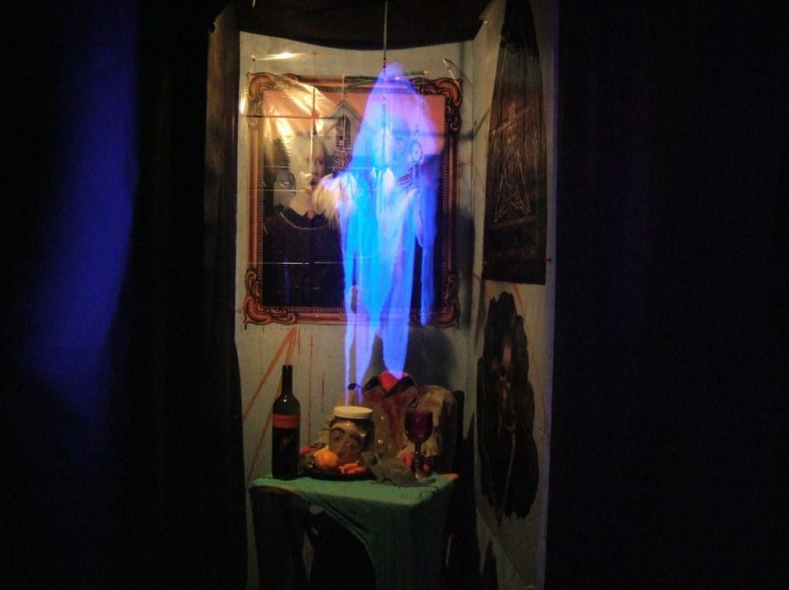 But the Pepper’s Ghost effect can be used for more than just ghosts. People have used it to create haunted mirrors and enchanted crystal balls. I can easily imagine people using it (both in haunts and in independent films) to create transformation effects, disintegrations, teleportation, alien scanners and much more. There are plenty of tutorials available out there, including one for use with a fader switch. Others have sought to reduce the expense by replacing the glass (or plexiglass, which is much safer) necessary for the effect to work with window tinting and shrink film. It’s even possible to accomplish the effect with plastic cling wrap, although at the cost of image quality. As shown in that last link, others have opted to look for inexpensive sources of plexiglass. Despite what the large scale examples mentioned above might have you think, the Pepper’s Ghost effect can even be housed in a small box. Besides being used for vehicle Heads-Up displays and a Star Trek: The Next Generation toy, home haunters can used it to create various types of “Transformation Boxes.” If you want to recreate the picture used to illustrate this article, you’re definitely going to want to go with plexiglass and follow these instructions. If you can’t get any plexiglass, fear not! After all, the awesome effects shown in the above video were accomplished using the shrink film method. Let your imagination, not your budget, define your limits. Successfully pulling this off at Halloween is all but guaranteed to make you the talk of the neighborhood, so have fun with it! UPDATE: As tablets and smartphones have grown in popularity, you can now find more and more tutorials about using them to create Pepper’s Ghost effects. The sci-fi direction that some have taken this effect in using that method is a very interesting breath of fresh air. Special thanks to Kevin Schonhofer for use of the image!